While doula support involves so much more than physically assisting a mother in labor, that aspect is a very important part of what a doula offers. She will provide you with physical comfort measures to help you find your inner strength and work with your body through the intensity of labor and birth. 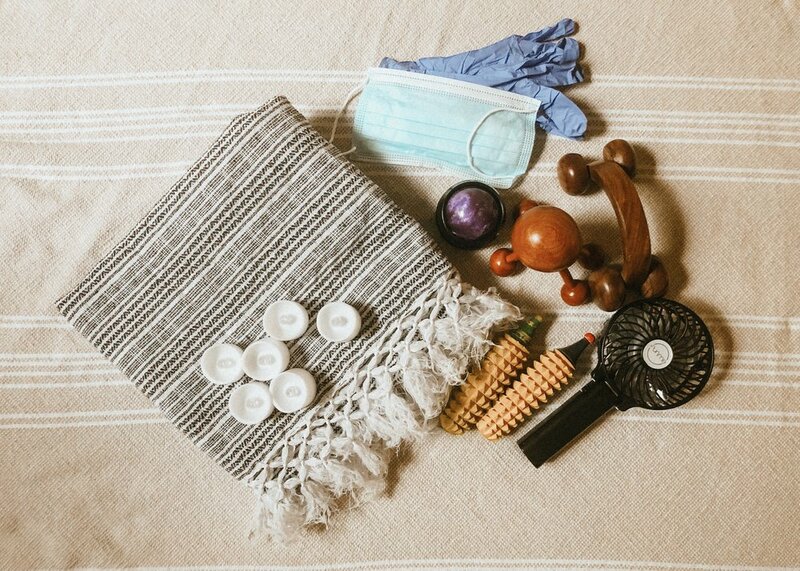 One of the ways a doula may offer support is through a few nifty tools that she carries with her. So, I’m going to give you a peek inside my own doula bag. I’ll share with you what I bring to each birth, how it can be used, and why it is beneficial. With a rich history in Mexican culture, a rebozo can be used in so many ways to support a birthing woman. It is typically gathered around the hips or belly and a sifting or gentle rocking motion is used. This can help release the pelvis, provide comfort, or encourage the baby move into an optimal position. It can also be used during labor for hip squeezes or for the mother to pull on to aid in the pushing stage. I bring two cool little tools that look like spiky wooden corn cobs. A laboring mother may find it helpful to squeeze them in her palms while working through a surge. This has to do with something called the Gate Control Theory. Our brain can only pay attention to so many stimuli at once, so the pressure on the nerve pathways of the hand crowds out the abdominal pain signals. I pull these out at births simply to help create to a relaxing atmosphere. Labor and birth cannot happen in the presence of adrenaline, so this is a small little something that I can contribute to help the space feel more calming and get the oxytocin flowing. While hands are great for massage and counter pressure, sometimes the sensation of a massager is more relaxing. I bring two wooden massagers with me - one with wheels and one for applying gentle pressure. I also have a small rolling massager that works wonders for releasing tense muscles in your back or legs (the little purple one in the photo)! It is not uncommon for a laboring mother to experience hot flashes. And the arm of whoever is constantly fanning to keep her cool will very quickly tire. So, I bring a battery operated fan with different settings to keep mama comfortable throughout her temperature fluctuations! Gloves stay in my bag simply because with birth work there is a possibility of coming into contact with bodily fluids. Also, they are latex-free in case of any potential allergies. A mask means that I don’t have to miss your birth, or risk catching a virus, if someone in your house is sick! It also means that if I am concerned that I may have come into contact with someone who is sick I can wear a mask to protect you and your family - if your wish is that I still attend your birth. I am very cautious about spreading any kind of illness, especially when birthing mothers and new babies are involved, so I am very up front with clients about any risk of sickness. Peanut balls may look like a strange exercise ball, but they can be an amazing tool when a laboring mother must remain in bed. They are wonderful for labor positions to help open up the pelvis so that baby can move down and into an optimal position. 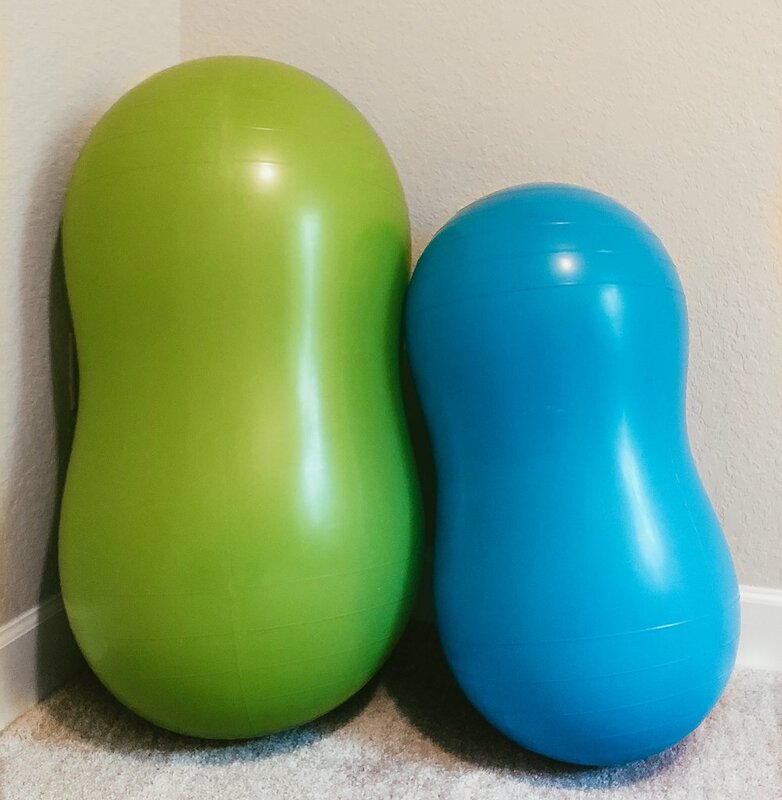 The use of a peanut ball may reduce labor time, reduce the time of the pushing stage, and contribute to fewer c-sections. While the items in my bag come with me to every birth, the most important things I bring are my heart and my hands. This may go without saying, but these two things are far more crucial to a positive birth experience than anything I actually pack in my bag. Whatever kind of birth you decide on, my heart is with you 100%. I will be there as a compassionate and empathetic supporter while still encouraging you to believe in your own strength. And if I left my entire doula bag at home, I would still feel confident in my ability to provide physical and emotional support with my own two hands. Aside from the things I bring with me, there are a few incredibly helpful items I always recommend a mother have on hand during labor, birth, and immediately postpartum. I provide each family with a list of recommended items and we discuss why I consider these items to be beneficial during their first prenatal visit. If you would like to have the support of a doula for your birth, reach out and we’ll meet for complimentary consultation! Did your doula bring similar tools to your birth? What was the most helpful? Comment below!